The first graph shows the year-over-year (YoY) change in reported existing home inventory and months-of-supply. Inventory is not seasonally adjusted, so it really helps to look at the YoY change. Inventory increased 1.1% YoY in May. 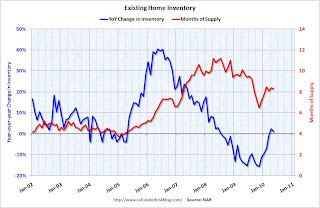 This is the second consecutive month of a year-over-year increases in inventory. Although the YoY increase is small, I expect it will be higher later this year. This increase in inventory is especially concerning because the reported inventory is already historically very high, and the 8.3 months of supply in May is well above normal. The months of supply will probably stay near this level in June, because of more tax credit related sales (reported at closing), but the months-of-supply could be close to double digits later this year. 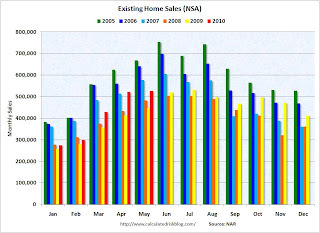 The second graph shows NSA monthly existing home sales for 2005 through 2010 (see Red columns for 2010). Sales (NSA) in May 2010 were 17.7% higher than in May 2009, and also higher than in May 2008. We will probably see sales at around this level in June because of the tax credit, however I expect to see existing home sales below last year in the 2nd half of this year. This was definitely a weak report. Sales were up year-over-year because of the tax credit pulling sales forward, but that does very little for the economy. The key is the inventory and months-of-supply, and if these two measures increase later this year as I expect, then there will be additional downward pressure on house prices.